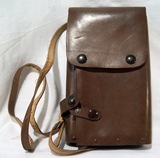 Maps case in leather for Italian Royal Army's officer. Inside the maps case is made with gridded celluloid sheets to allow consultation of maps even when it rains. Like new conditions. Notify me of updates to Italian officer's maps case.